There are plenty of amazing places to ski and snowboard in North America, but some are much more popular than others, not necessarily because they’re better, but because they are better known. If you’re looking for smaller crowds and shorter lift lines on your next ski trip, we’re here to help (we’ve got a complete guide for how to fly with skis and snowboards, too). We’ve rounded up our picks for top alternative ski resorts in North America, where the cost and the crowds are in check and where both vibe and the weather are chill. If you’re hoping your next vacation involves skis or a snowboard, these awesome alternative resorts may be just the ticket for an affordable and fun escape, and we can help you find just the tickets to get you there. Boyne Highlands, Harbor Springs, Michigan, U.S. This ski resort near Harbor Springs, Michigan, offers more than just the chance to swish down the slopes. There are 55 runs and four terrain parks here, spread out over 435 skiable acres, with the longest run (North Peak Pass) just over two kilometres long. When you’re not skiing or snowboarding, there are plenty of other ways to keep busy at Boyne Highlands. The resort also offers snowshoeing, cross-country skiing, fat tire biking, tubing and even winter zip-lining. Don’t miss: Head over to the Ski Valet between 6 and 9 p.m. daily for some s’mores by the bonfire. Closest major airport: Traverse City, 2 hours away by car. You’ve likely heard of Mont Tremblant, Mont-Sainte-Anne or Le Massif. But if you’re looking for something smaller or a little more laid-back, think about booking your ski holiday at Mont Blanc. Located in Quebec’s Mont Tremblant ski region, Mont Blanc is no slouch when it comes to what it offers skiers and snowboarders. The resort has 42 trails and one of the highest verticals in eastern Canada. All skill levels are accommodated here, and Mont Blanc has one of Quebec’s largest ski schools with over 125 certified ski and snowboard instructors. There’s also plenty of opportunity for snowshoeing and kids will love the large indoor playground Jungle Magique. Don’t miss: Relaxing with a local craft beer by the fire after a day of skiing at Igloo Bar. Closest major airport: Montreal, 75 minutes away by car. Combine a trip to Canada’s capital with a few days of skiing at Calabogie Peaks. 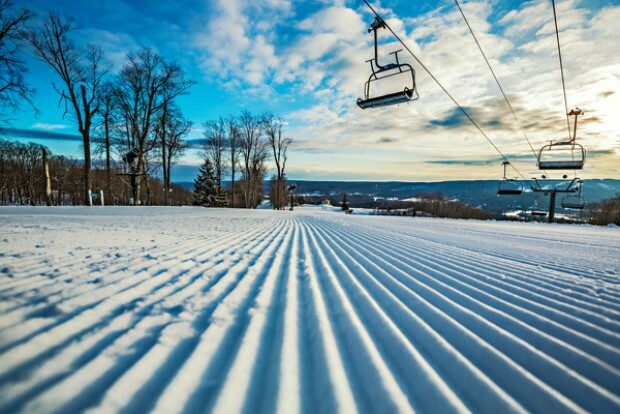 This ski resort has 80 acres of skiable terrain consisting of 24 trails and three terrain parks. If you need a break from skiing or snowboarding, you can do some cross-country skiing, snowshoeing, ice fishing or ice skating. And if you’ll be staying on-site at Calabogie Peaks Resort, you can enjoy the indoor pool and outdoor hot tub. Don’t miss: Love live music? From December to March, Calabogie hosts a series of après-ski live shows. Closest major airport: Ottawa, one hour away by car. 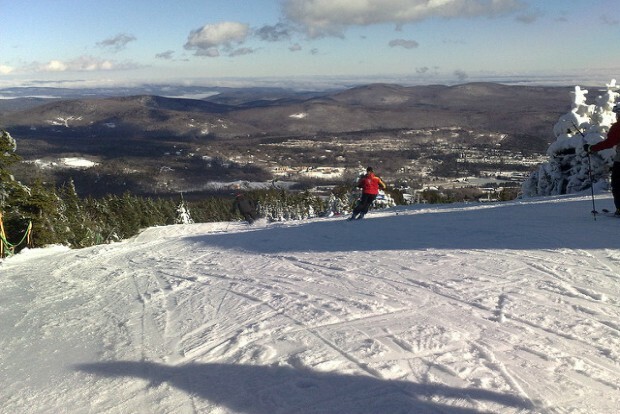 Mount Snow, West Dover, Vermont, U.S.
Vermont’s Mount Snow is a multifaceted, all-season resort that offers plenty of winter activities in addition to some seriously great skiing. At Mount Snow you’ve got your choice of 87 trails spread over 589 skiable acres, as well as eight terrain parks including one with (snowboarders, take note) a superpipe with 18’ walls. 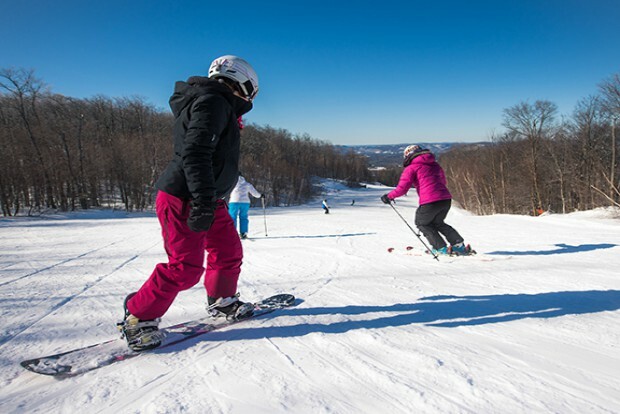 When you want to take a break from the slopes, you can turn your attention to cross-country skiing, snowshoeing, snow tubing or take a snowmobile tour of Green Mountain National Forest, where Mount Snow is located. Don’t miss: The spa at Mount Snow offers guided woodland hikes led by a naturalist. Make a day of it and get the package that includes lunch and a scenic chairlift ride. Or really treat yourself and spring for a post-hike massage. Closest major airport: Albany, New York, 90 minutes away by car. 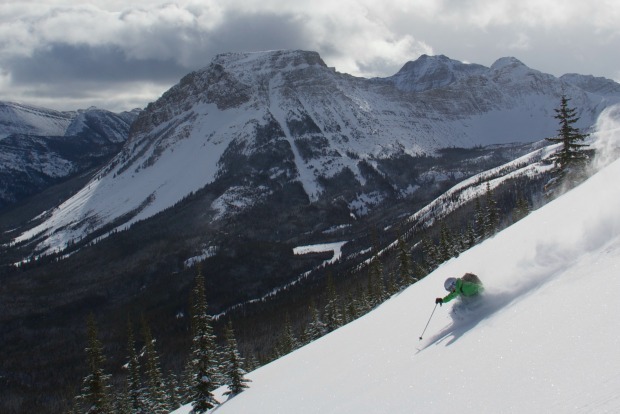 Alberta’s Rocky Mountain resorts are legendary, and you probably already know the big names, like Lake Louise Ski Resort and Sunshine Village, but you might want to think about giving Castle Mountain in Pincher Creek a try. There are over 79 runs here on two mountains, with an impressive 3,592 acres to test your downhill muscle. If fancy ski or snowboard work is what you’re after, you have your pick of three terrain parks. Castle Mountain also offers guided snowshoeing tours. Tours are two hours in length and the cost includes a $10 voucher for the on-site pub. Don’t miss: If you’re looking to challenge yourself, or just try a different type of skiing, Castle Mountain is one of the only places in western Canada to offer cat skiing. Skiers get transported via snowcat to more open terrain where they have a chance to ski in the backcountry. Closest major airport: Calgary, just over 2 and a half hours away by car. Steamboat Springs Resort, Steamboat Springs, Colorado, U.S.
Colorado is home to many well-known ski spots like Aspen and Vail, but if you’re looking for an alternative, give Steamboat Springs, home to Steamboat Resort, a try. 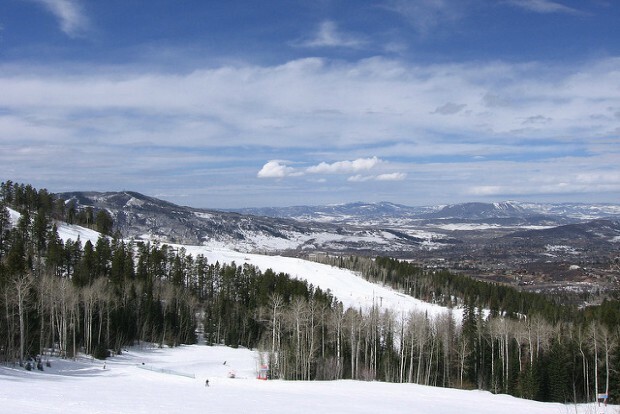 Steamboat is part of a large mountain chain that includes Mount Werner, Sunshine Peak, Storm Peak, Thunderhead Peak, Pioneer Ridge and Christie Peak. This means skiers and snowboarders have access to 2,965 acres and 165 trails of varying skill levels. The longest run – dubbed Why Not – is nearly five kilometres in length. There are also four terrain parks and the chance to enjoy other winter activities. Take advantage of the free ski clinic with Olympic Silver Medalist and World Champion Billy Kidd, or take a free mogul clinic with Olympic Medalist and World Champion Nelson Carmichael. Don’t miss: Take a long soak in the natural hot springs at nearby Strawberry Park to soothe tired muscles. Closest major airport: Denver, three hours away by car. Skip over Whistler and make Fernie, BC, the base for your next ski holiday. The former mining town is filled with opportunities to get out and explore nature, including, of course, skiing and snowboarding. 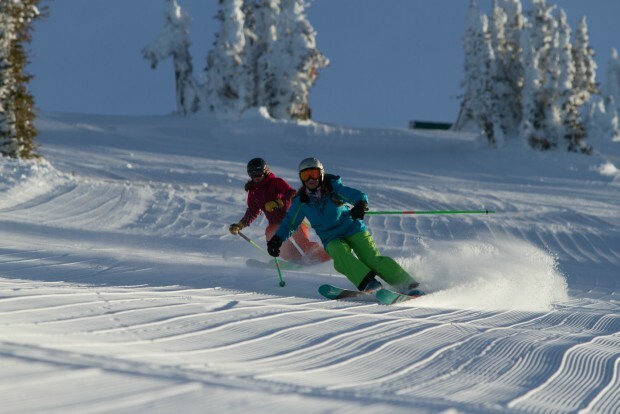 Fernie Alpine Resort has 142 trails spread out over 2,500 acres of varying terrain. Other fun ways to enjoy the snow and scenic surroundings include full and half-day snowshoe tours, winter fat biking (take a tour or go out on your own), cross country skiing and cat skiing. Don’t miss: Stop in at Fernie Brewing Co. in the town of Fernie for a tasting. Your $5 gets you a flight of four beers with all the money going to a local charity. They’ve raised over $50,000 since December, 2013. Closest major airport: Canadian Rockies International Airport, 1 hour away by car. Grand Targhee Resort, Alta, Wyoming, U.S. 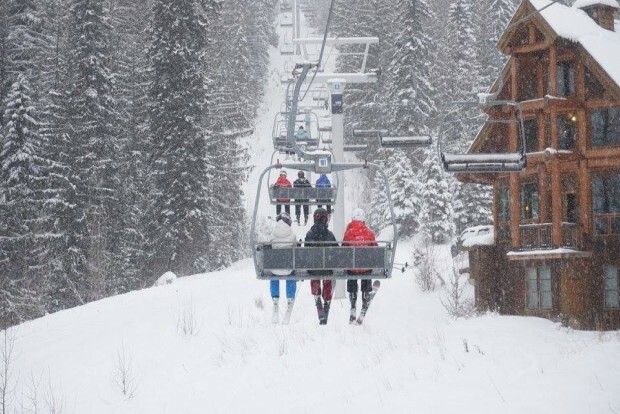 Skip the crowds at nearby Jackson Hole for a calmer skiing experience at Grand Targhee Resort. You’ll still be in the Tetons, but without long lift lines, and you might even find you have some trails all to yourself. There are 95 trails here on well over 2,000 skiable acres, with runs for every skill level. If you’re new to the resort, take a free daily mountain tour to get a lay of the land before you hit the slopes. You’ll also find a snow tubing park at Grand Targhee, as well as the chance to snowshoe, cross-country ski, do some winter fat biking, or take a backcountry snowmobile tour. Don’t miss: Try a Swedish or hot stone massage followed by a soak in the outdoor hot tub. Or, if you’re visiting as a family, unwind in the on-site arcade, which serves homemade pizza on weekends and holidays. Closest Major Airport: Jackson Hole, 90 minutes away by car. Mt. 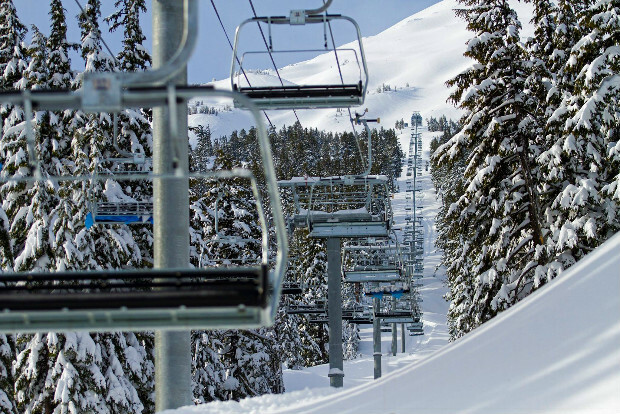 Bachelor Ski Resort, Bend, Oregon, U.S.
Head to Bend, Oregon, for a chance to ski at one of the six biggest ski areas in the United States. Despite its size, Mt. Bachelor doesn’t get the crowds of some of the other big resorts, making it an ideal ski spot for a more laid-back holiday. Choose from 101 trails on over 4,300 acres. The longest run here is over six kilometres of scenic downhill action. In addition to skiing and snowboarding, visitors can take free 90-minute snowshoe tours (snowshoes are provided) or enjoy some snow tubing. Don’t miss: If you’re a beer fan, Bend is known as “Beer Town USA” for the number of breweries here. Sample some of the best beer in Bend with the Bend Ale Trail, which is walkable, or book a tour. Closest major airport: Eugene, OR, 3 hours away by car. Alyeska Resort, Gildwood, Alaska, U.S. If you’ve never thought of Alaska as a ski holiday destination, think again. Alyeska Resort is tucked in the Chugach Mountains and (advanced skiers, take note) boasts the longest-continuous double black diamond ski run in North America. There are 76 trails here on over 1,600 skiable acres and two terrain parks for freestylers. You can also cross-country ski here and do some snowshoeing. Snow cat skiing and heli-skiing are also options at Alyeska. Don’t miss: The views. 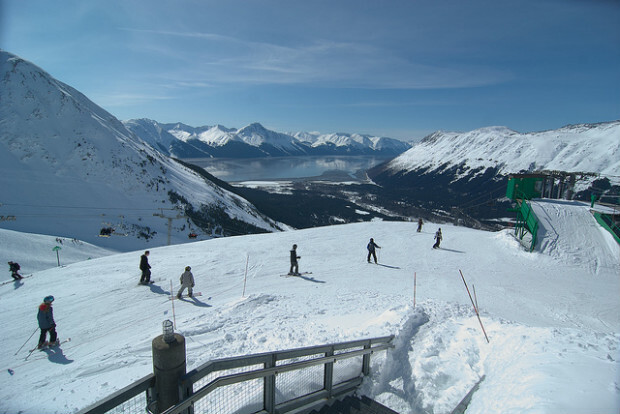 Alyeska is the only North American ski resort with mountain, glacier and ocean views. Closest major airport: Anchorage, just under an hour away by car.